My opinion of Laphroaig's Quarter Cask whisky has shifted over the years, and not in a positive direction. I was happy to champion the NAS Laphroaig Quarter Cask bottlings 6-7 years ago. The whisky was 8-12 years old and the oak was less intrusive than expected, and the whole thing was very good. The current version is......different. I wouldn't doubt the whisky is half the aforementioned age, and the oak is now in fact intrusive. It has become Laphroaig's "craft" whisky, with all the bad connotations that come with the C word. If I were to review the current version it would be only in comparison to an older edition. But I'd have to source both. ...which is 5.5 years. Which only went to bolster my assumption about the current age of the regular Quarter Cask and its shift in quality. But, I'm always willing to give it a go since the Càirdeases (Càirdi?) tend to be well made. Good news everyone, the color is very pale. No extra glow from loaded oak or e150a. The nose is nutty and sugary (like white frosting). The peat reads more toasty than medicinal. Hints of lemon peel, rubber and dried herbs. A vanilla bean note appears, then grows with time. It's young, peppery and herbal stuff on the palate, though the mouthfeel is thicker than Monday's Ardbeg. A brisk herbal bitter bite. Not much heat. Limes, almond butter and charred meat. Gets saltier and sweeter with time. Pepper, sugar, lemon juice and beachy peat in the finish. Salted caramels, wood smoke, metallic dust and mint gum on the nose. A wee puff of farminess. On the palate it's vanilla, sugar and dried herbs. Luckily the herbs are the loudest. Also lots of mint and chili powder.....which then becomes smoked paprika in the finish. Then tart citrus and peppery smoke. Slightly less sweet than the palate. The whisky is fine. I prefer it neat, slightly. It's rare for me to enjoy a whisky's palate much more than its nose, as with this one, though I felt the same about Laphroaig Lore. The vanilla-ness was to be expected, but I wish there were less of it. The finish kinda whimpers out. But, thankfully, it's slightly less sweet than Ardbeg Hooves. It never feels like 57.2%abv, which is good. But it never really feels like Laphroaig either. Perhaps I've been spoiled by the 2015 Càirdeas, and impressed by the rebound of recent 10yo Cask Strength batches. Normally I praise Laphroaig for the accessible pricing of the Càirdeas releases, but I'm in no rush to spend $80 on a five year old whisky. I no longer do that for Kilchoman, a small family-run distillery, so I'm less inspired to do so for a large corporate distillery. My Annoying Opinions, who generously provided this sample (thank you generous MAO! 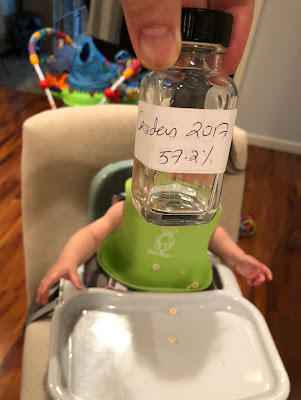 ), holds this whisky in slightly higher esteem than I, while the Whiskybase community, as usual, regards it with greater enthusiasm than either of us do.